It’s amazing for me to look back on the past five years and note how much ground and the range of topics I’ve covered through the blog. 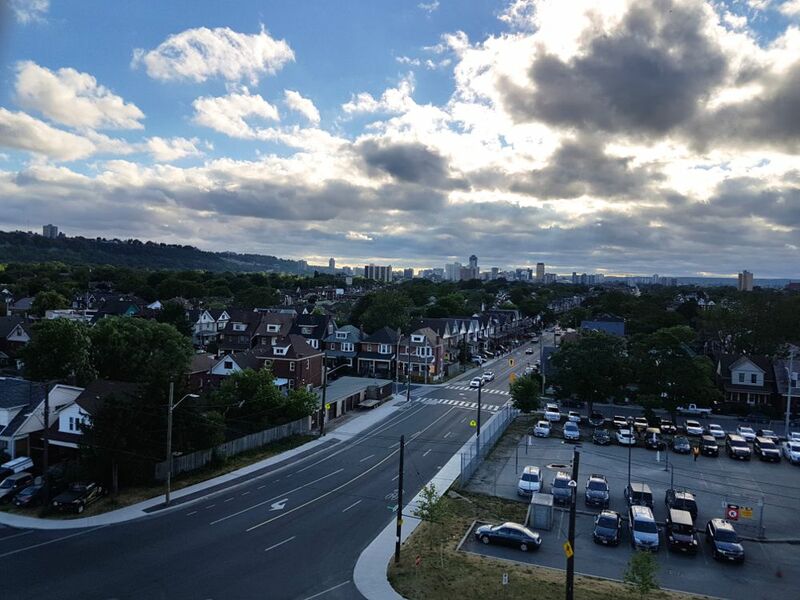 The point of starting I Heart Hamilton for me was to not only re-discover my hometown and become more invested in my surroundings, but to also experience new things. Say yes to life! 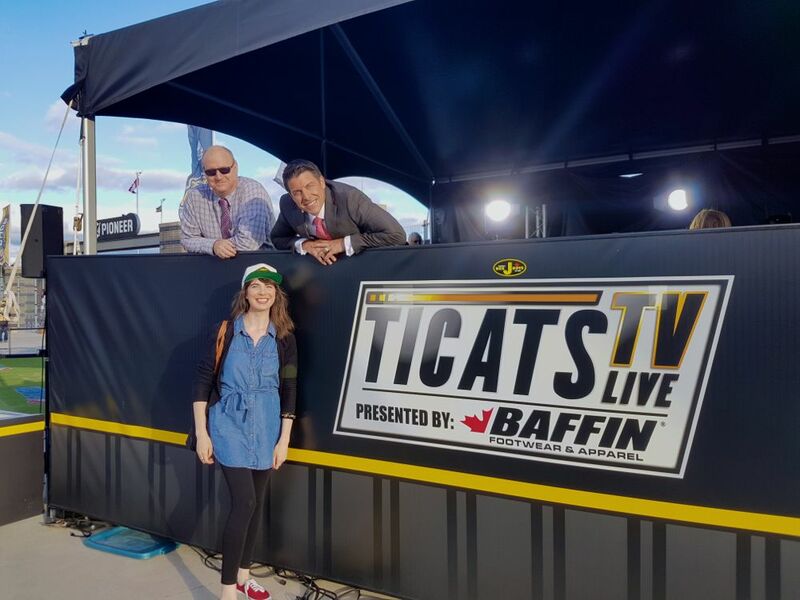 One thing that has been lacking around here is the sports department, so when the opportunity came up to attend my first TiCats game, I jumped at it. 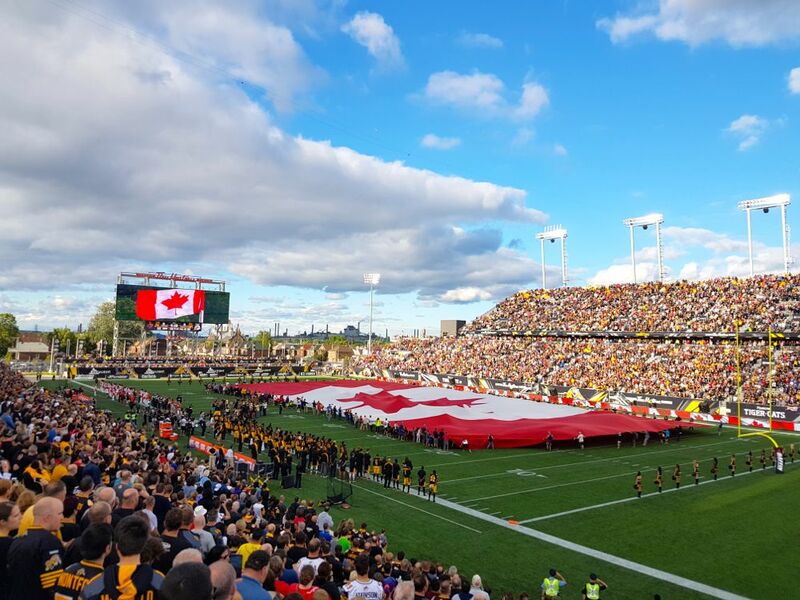 Making my first TiCats experience even more exciting, this was our Home Opener and right on Canada Day. Not that I have another game to compare it to, but it felt extra festive! It was a cloudy and rainy morning, but luckily by late afternoon the sun was out and revealed the most vivid, blue sky, with massive fluffy clouds. 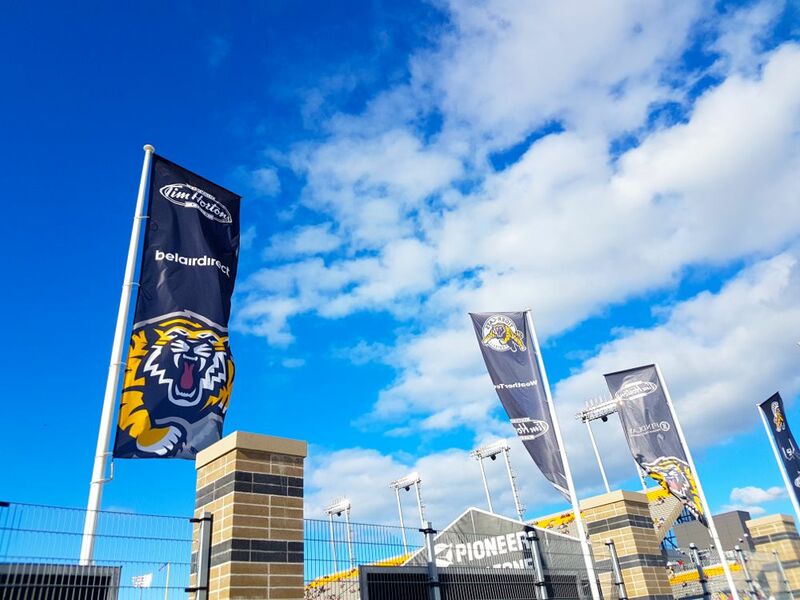 The only downside – the wind! It wasn’t the most ideal steamy summer night that should come with July, but we made the best of it. 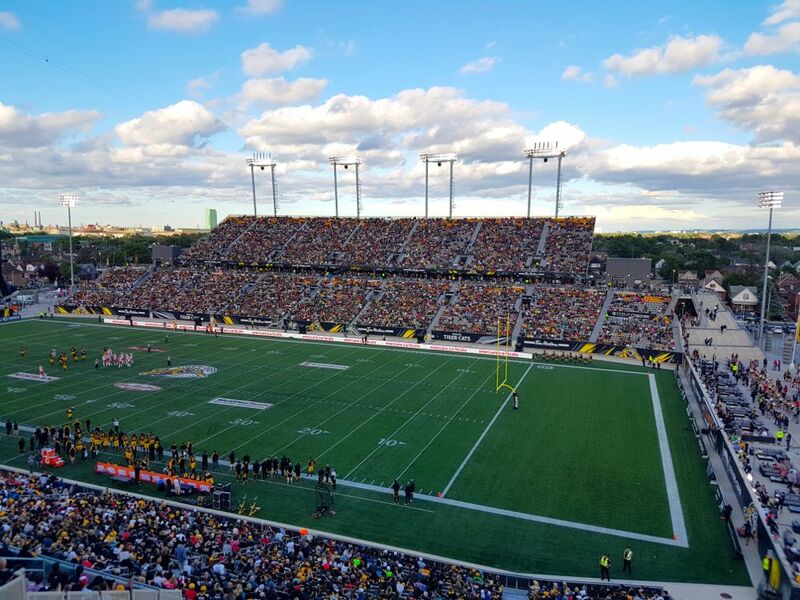 After the whole stadium kerfuffle, I’m all for Tim Hortons Field ending up in the east end of the city. It is really impressive. 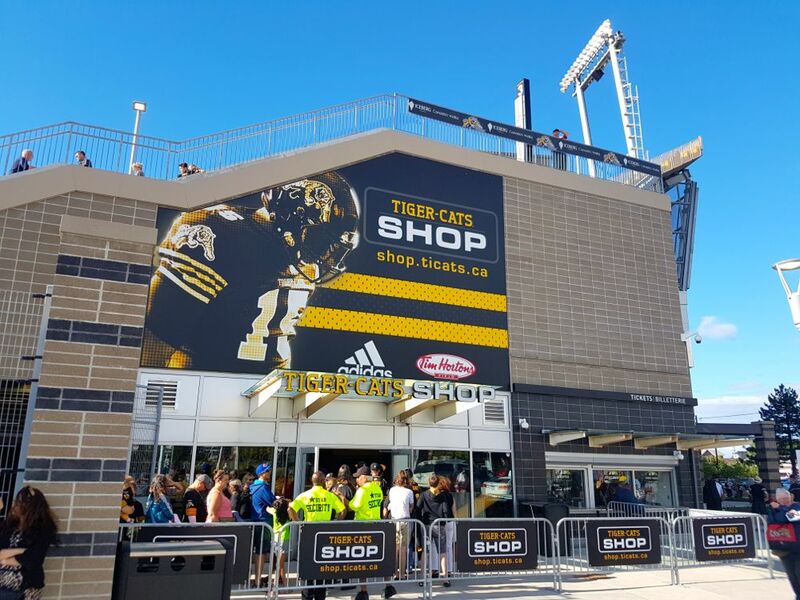 My first introduction to Tim Hortons Field was being part of Climb For Cancer promotion a few months ago, thanks to organizer Brian Humphrey. 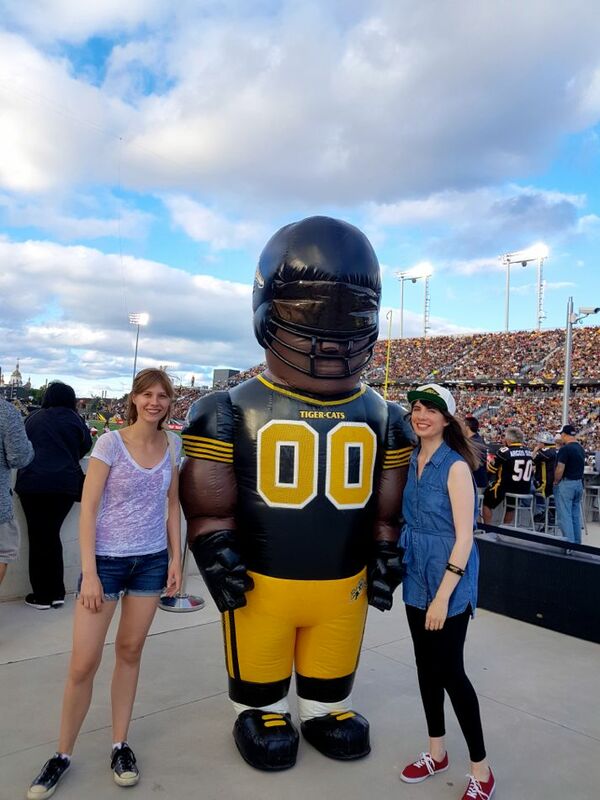 It was my first time at the stadium, and also my first run-in with the TiCats. I got to meet Pigskin Pete, himself, Dan Black. That day I also met TiCats player Chad Owens. Chad gave me one of his “Exhale Inspiration” bracelets and the mantra struck me. With this message, Chad “aims to inspire each and every individual to welcome and respect, not fear the challenges of life and the teachings they bring.” To use any platform you have to spread good vibes and inspiration – I love that. So I’m new to this, but I was feeling the part of “sports fan” in my spiffy Crafted Hamilton cap. 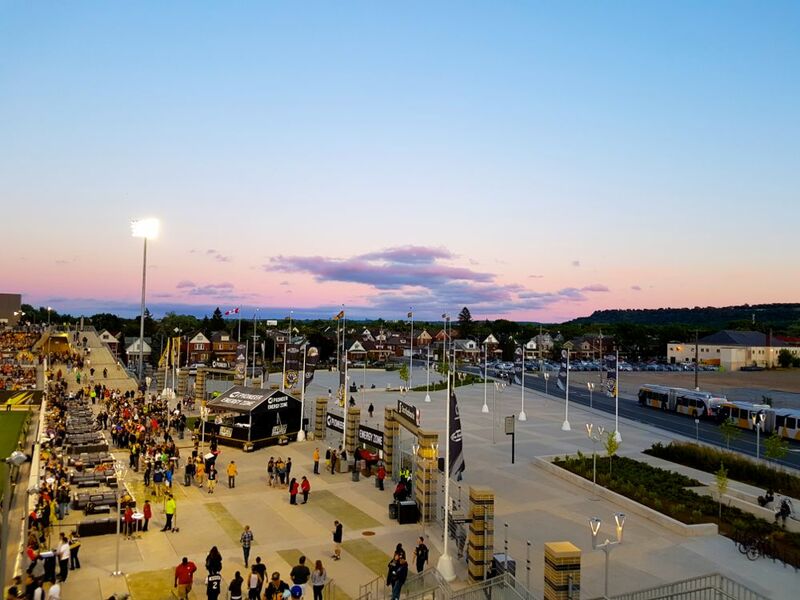 Before grabbing our seats, Lisa and I did a lot of walking around the stadium to get the lay of the land. 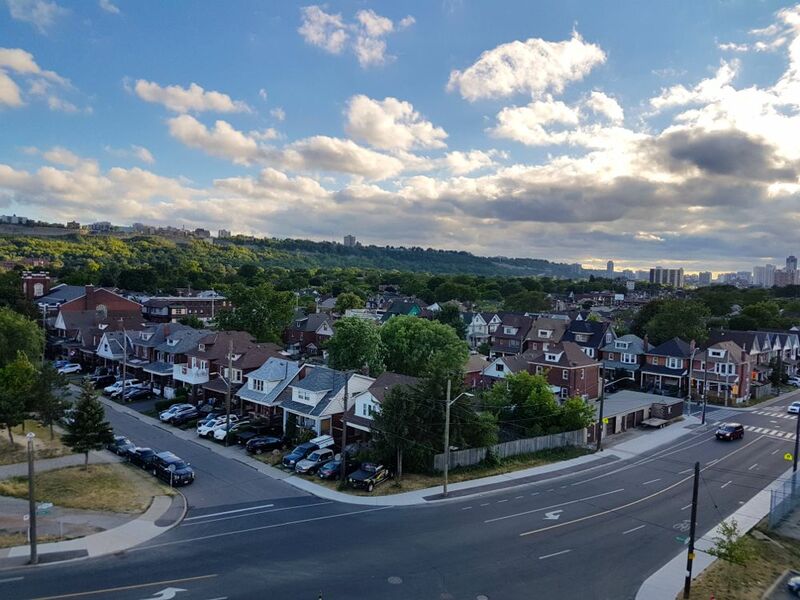 There are so many amazing vantage points wherever you are. Walking up the steps (also a great workout! ), the view got even more striking at each level. 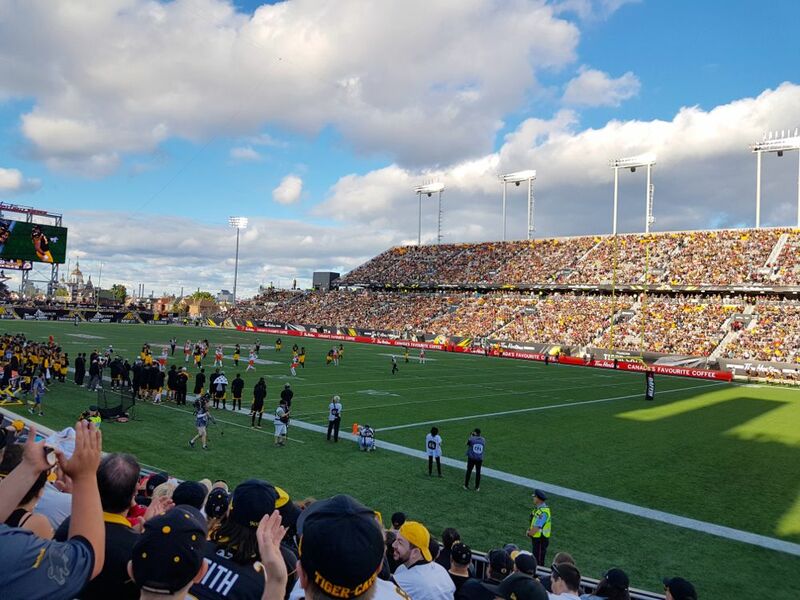 Our seats were fantastic – my thanks to Mike Ecclestone of the TiCats staff for hooking me up. 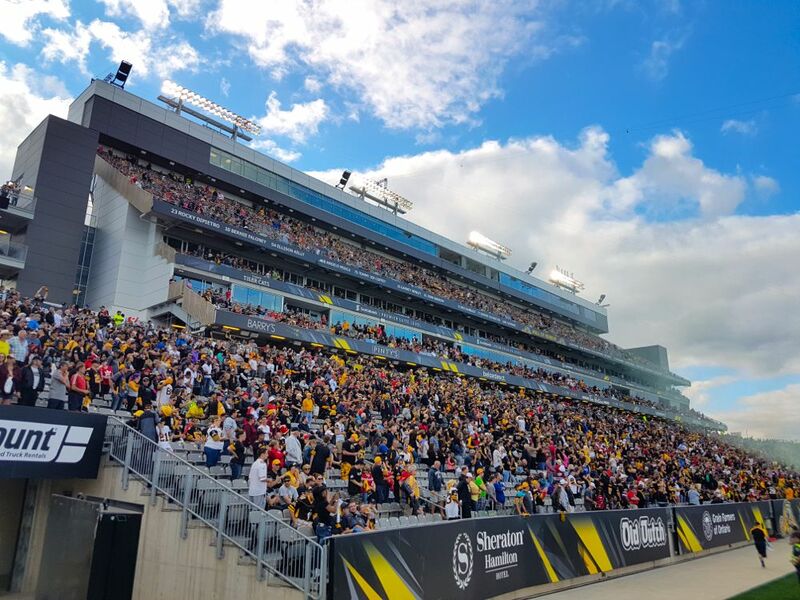 The sight of Tim Hortons Field is nothing short of epic – I suppose season ticket holders are used to it, but it still must be exciting every time you’re there. Because it was not a familiar sight for me, it felt larger than life, seeing it all in person. It was so foreign to me, it felt like being in a movie or something! 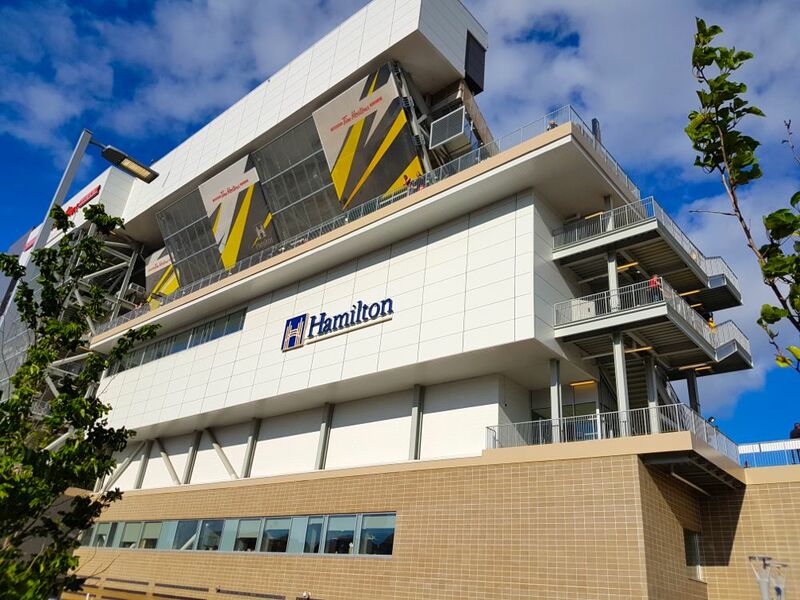 It really made me appreciate that Hamilton has such an impressive arena. Then it was game time! Play ball! Hut hut? Eat ’em raw! I’m still learning the lingo. There was an awkward moment when I realized my nails were painted the colour of the opposing team. Who knew the B.C. Lions wear orange? My apologies, Hamilton. Lisa and I also pondered an important sports etiquette question – how does one successfully start The Wave? I didn’t attempt it. Next time. We were among your typical rowdy and enthusiastic sports crowd. It makes you feel amped up, just being part of that kind of shared experience, especially a shared Hamilton experience. I had never been in the middle of a crowd of people chanting Oskee Wee Wee, so I can now check that Hamilton rite of passage off my list. As with any live event, whether it’s a concert or sports, nothing beats the feeling of being a spectator at a live event. The energy and excitement of being part of something bigger than yourself is just awesome. I understand why sports fans are so diehard and dedicated. New career for me – sports broadcaster? At the end of it, unfortunately we didn’t win this one. Get ’em next time, boys! 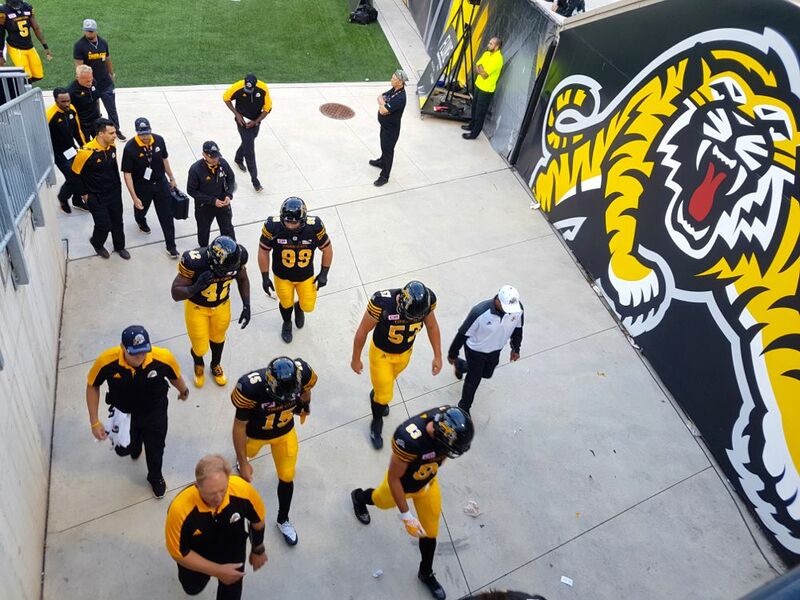 But I loved my introduction to the TiCats, and let’s be honest, football for that matter! It was another big Hamilton experience for me, which just goes to show, I’m nowhere near done exploring yet. Check out the full schedule of home games this season to get in on the action. 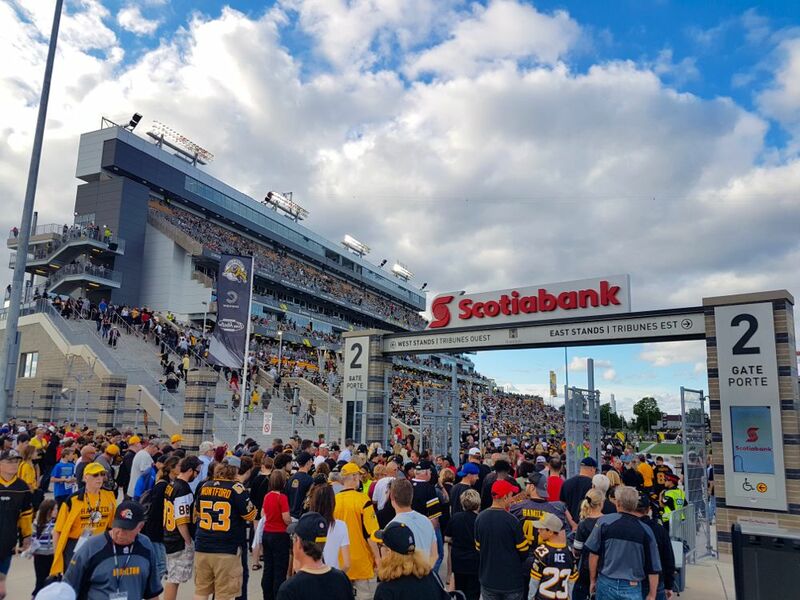 Note: My tickets to the game were courtesy of Mike Ecclestone at The Hamilton Tiger-Cats, but all thoughts about the event are my own. I haven’t been to a game in years, we should plan a CoMotion field trip!